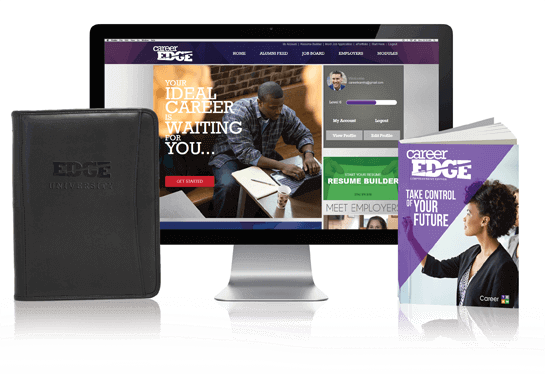 The Career EDGE is a platform that provides content and tools that enhance the candidate experience from admission to job placement resulting in increased retention, graduation, and placement rates. Our solutions provide faculty and career services staff with scalable tools that improve professional development and employer partnerships. The Career EDGE content consists of a series of life skills and professional development modules designed to enhance confidence and improve employability of graduates. Modules can be easily incorporated into student success and career development courses, or integrated into core curriculum throughout the student life-cycle. The Success Toolkit provides students with a series of customized and institution branded tools that prepare students for the interview and beyond! Students build an ePortfolio throughout their matriculation where they can create video resumes and showcase achievements to potential employers. To gamify the student experience, badges are awarded for achievement of academic and professional development milestones. Upon graduation, the ePortfolio serves as a interactive resume differentiating your graduates and giving them the EDGE. 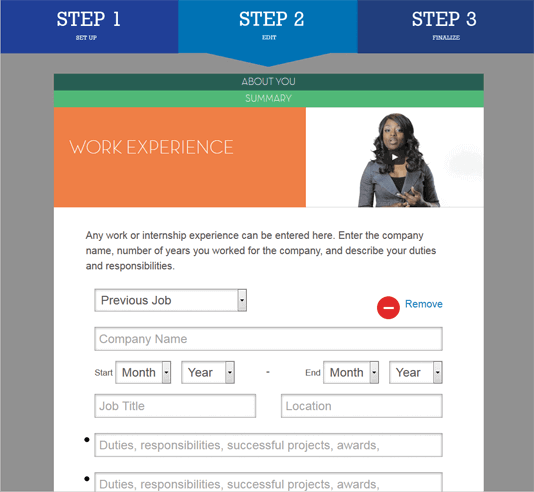 Students easily create resumes by following the guided instruction in our Career EDGE Resume Builder. Select from a library of Career TEAM templates or import your institution’s favorites. Upon completion, the resume is available for download and ready to send to potential employers. Online applications are often designed to filter out candidates before they reach the interview. Prior to completing a live application, the Carer EDGE Mock Job Application allows students to work through a simulation with video instruction and tips for common mistakes. Career EDGE follows a read, listen, watch, apply format. 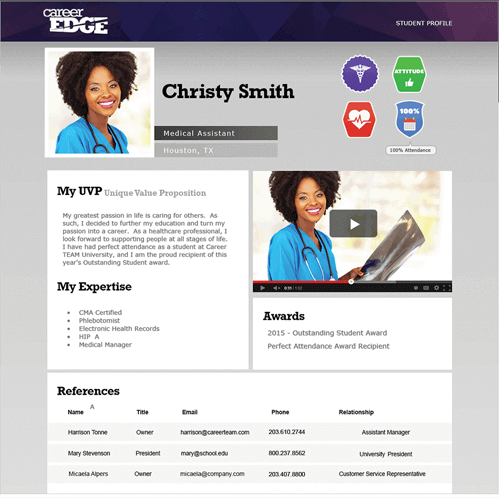 Career EDGE provides all instructor support material for classroom based instruction including syllabi, lesson plans, PowerPoints, and assessments. For online courses, we provide instructional design support, discussion questions, and deep LMS integration. Google has changed the way we search for information. 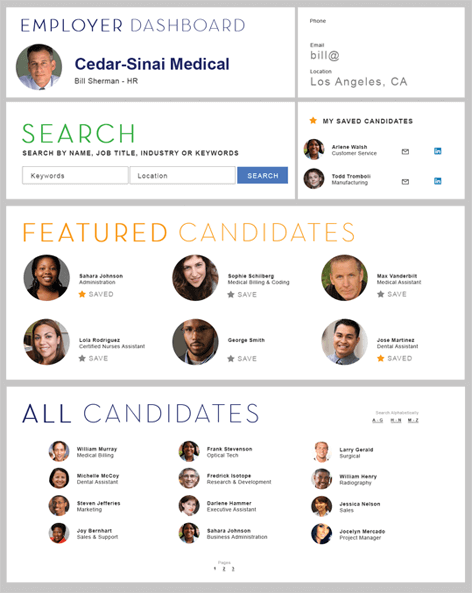 It has also changed the way employers search for candidates. The Career EDGE Employer Matching Platform allows employers to customize their search of your graduates and find the perfect fit. This solution differentiates your students and aligns with the modern employer approach to talent acquisition. The Career EDGE Administrative dashboard allows your organization to monitor customer, staff, and employer progress, warehouse resumes and ePortfolios, track internships, and capture employment information. Fields can be customized based on accreditation and institution requirements. Career TEAM believes in embracing innovative technology solutions. With the rise of Virtual Reality,we have invested in helping educate using the most engaging form of instructing today.